Isn’t it odd that an 800-mile pipeline that runs across environmentally sensitive land has been permitted without any mention in the media? Not a word about it from President Obama either. 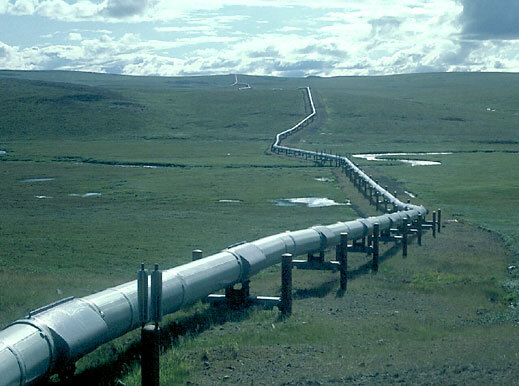 Obama’s Secret Pipeline will be built over land that’s much more sensitive than that of the Keystone XL pipeline, which gets nothing but front-page coverage. It will actually be 17% (six inches) larger in diameter than Keystone XL (36 inches) and it will transport natural gas, not oil. Bill 138 The Senate of Alaska, the state in which the pipeline will be built, has just passed Bill 138, which makes the state a partner of three of the world’s largest oil companies, including one that has a horrible environmental track record on US soil. In a nutshell, Alaska’s government is now partners with BP, ExxonMobil, and ConocoPhillips. Only one more signature is required—Governor Sean Parnell’s—and it’s expected that he will sign the deal. Not Even the US Government Wants US Dollars For more than 100 years, the US government has been receiving a royalty and tax revenue paid on the amount of oil or natural gas produced on American soil—a fee that is paid in US dollars. Bill 138 has changed this forever. Instead of Alaska receiving its dues in US dollars, the state legislature has decreed through Bill 138 that the state will be paid “in kind.” In other words, the state will be getting its share of royalty and tax revenue in natural gas instead of US dollars. For the record, this is the first time ever that a US state has entered into a partnership like this. Essentially, Alaska is now a 25% equity partner with BP, ExxonMobil, and ConocoPhillips—which also requires the state to cough up cold, hard cash to build the entire project, including the 800-mile-long, 42-inch-wide pipeline. Overall, the project is currently estimated to cost north of US$50 billion, and we expect that when all the capital expense overruns and government inefficiencies are accounted for, the whole project will come in at more than US$75 billion, using the total costs of similar projects for comparison. But it will be 2015 before the final negotiations and the specific details of the partnership are agreed on, and remember, the devil is in the details. Who do you think will get the better end of the deal—a bunch of government bureaucrats with zero oil and gas experience, or the world’s top oil- and gas-producing companies? I know whom I’m betting on. Which leads us to the point of this weekly missive. And the Winner of Obama’s Secret Pipeline Is… We already know which company will be building and operating Obama’s Secret Pipeline. The company I’m talking about has a lower price-to-earnings (P/E) ratio and a better yield than all of its peers. That’s good, because shareholders get paid a monthly yield for owning the stock while sitting back and watching the share price rise as well. The Ultimate Oil Toll Booth Think of it this way: this company charges the world’s most powerful oil and gas producers for every barrel of oil that passes through its “road network,” and now it can also charge the state of Alaska. Regardless of the price of oil or natural gas, this company gets its fee. It’s a low-risk way to benefit from a high-risk enterprise. This company is a current Buy in our Casey Energy Dividends portfolio. The Energy team is currently working hard on the upcoming issue, which will in detail cover the company that’s bound to gain big from Obama’s Secret Pipeline. I know you haven’t heard about this pipeline yet, but you will soon enough. That’s what we do here at the Energy Division of Casey Research: We’re the first to uncover breakthrough stories, and the first to uncover the best energy investment opportunities in the world. Doug Casey and I just got back from a whirlwind European tour, where we visited many of Europe’s most promising energy projects. 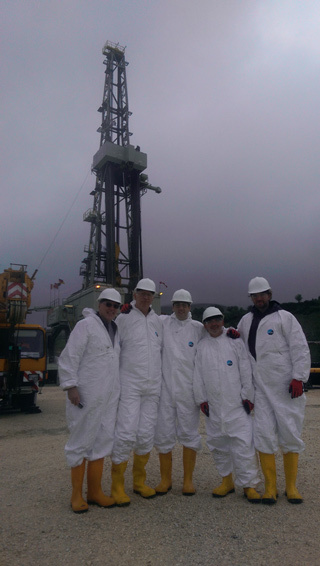 Here’s a picture of Doug Casey and me at Europe’s largest onshore drill site. 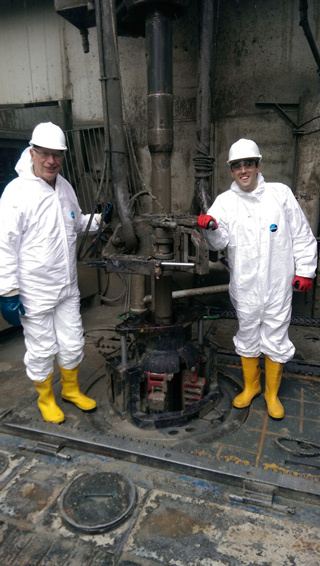 This drill rig is 15 stories high and uses about 16,000 liters of diesel a day to turn the drills—which Doug and I are holding in this picture. As a side note, just the crank shaft that we’re holding costs US$2 million—this rig is expensive and gigantic. For you to get a better perspective on the true size of Europe’s largest onshore drill rig, here is a picture of Doug Casey and me with our friends Frank Holmes, Frank Giustra, and Matt Smith. (From far left to right: Frank Holmes, Doug Casey, Marin Katusa, Frank Giustra, Matt Smith) Do Your Portfolio a Favor and Try Out the Casey Energy Report Doug Casey and I have done all the hard work for you. The current issue of the Casey Energy Report is a compilation of our Europe trip, including in-depth descriptions of our site visits and a new recommendation with a hugely promising project in an out-of-the-way European country that we personally checked out. The company is backed by mining giant Frank Giustra, and you bet he knows what he’s doing. The Casey Energy Report comes with a free one-year subscription to Casey Energy Dividends (a $79 value), including, of course, the upcoming May issue with our “Obama’s Secret Pipeline” pick. There’s no risk in trying it: You have 90 days to find out if it’s right for you—love it or cancel for a full refund. You don’t have to travel 300+ days a year (as we do) to discover the best energy investments in the world—we do it for you. If you don’t like the Casey Energy Report or don’t make any money within your first three months, just cancel within that time for a full, prompt refund. Even if you miss the cutoff, you can cancel anytime for a prorated refund on the unused part of your subscription.